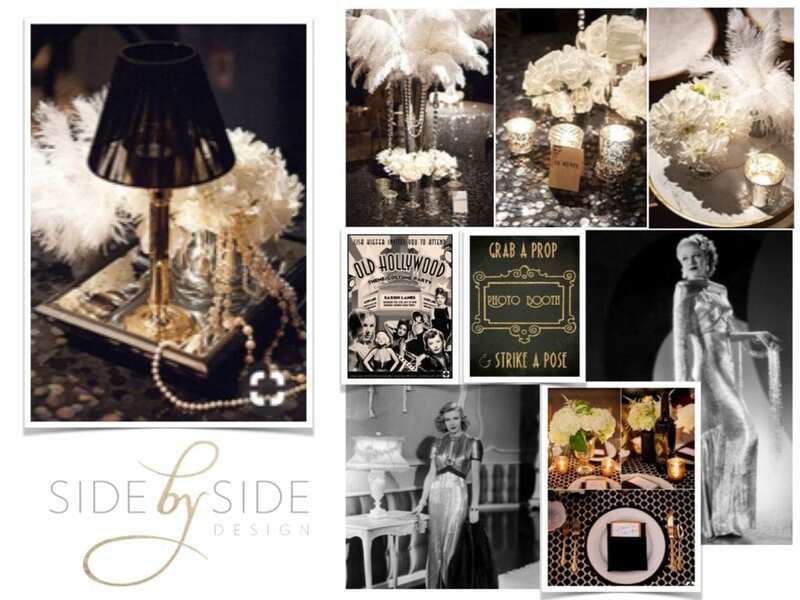 Follow us on Instagram @sidebysidedesign for more all month long as we share our Designer Day! We plan to share our “Favorite Five” for the month of January on the 25th and as always will be sharing what’s inspiring us for the month ahead on the first Friday. See ya soon! Every new year we take the time to reflect on the past year, re-evaluate our business model, and come up with goals and ways to take our business and blog to the next level. What a great opportunity to update our readers on our ever-evolving business model! We are overjoyed to say that we have once again spent the past year continuing to build a brand we are beyond proud of. 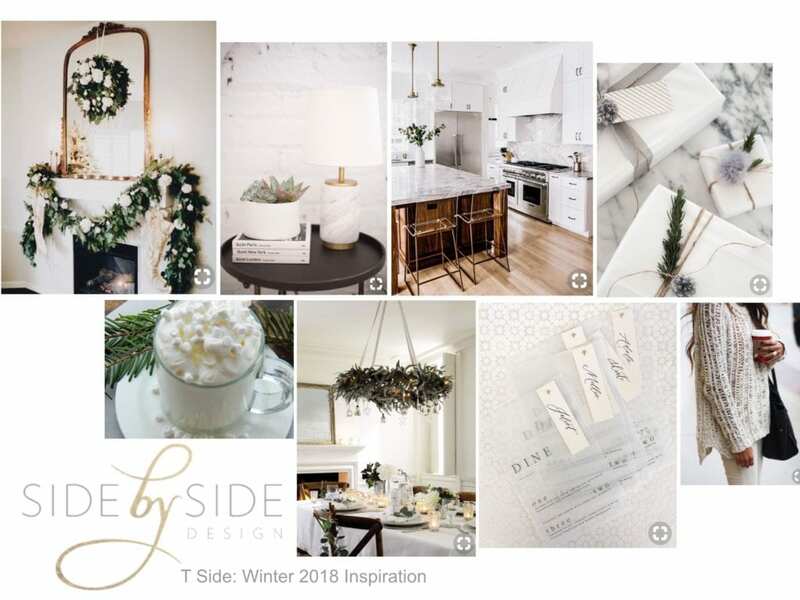 This year even more than ever as the essence of Side by Side Design (finding that magical place where Interior Design and Event Planning come together) has really been at the forefront of our minds. In an effort to educate past, current, and future clients on what we are all about, we have worked hard on our branding. We have designed T-shirts to wear on installation and event days, updated our business cards, created promotional materials for the holidays, and are working with a web designer next to showcase many of our favorite projects on our website’s portfolio pages. Oh yeah … and we hired our first employee! In our personal lives, Tami became a mom in March and has been working to find a balance between home and work. Lauren’s twin girls started preschool and her oldest, Ava, is now in Kindergarten. 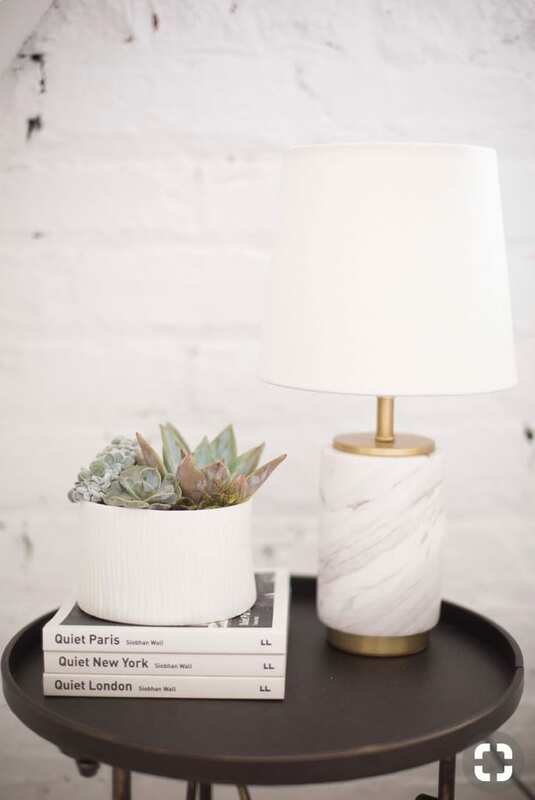 She remodeled and moved into her new home this year too (Keep checking in to see her posts from her Modern Bohemian Home Tour). To say that we have been busy is an understatement, but we wouldn’t have it any other way! As this is officially our second to last post of 2018 (“Favorite Five” to come on Friday), we thought what better way to start the new year than to re-cap the past year’s worth of Interior Design (Lauren’s side), Event Planning (Tami’s side), custom made decor, guest bloggers / collaborations, and monthly inspiration. We set a goal for ourselves last year to post every Wednesday and Friday and to keep the content of our blog much more focused on the two sides of our business. We have worked very hard to make this goal a reality. We have introduced our readers into our lives as well as our creative passions, and have given monthly previews for what is to come and recaps of our “Favorite Five” things we have done or begun … and don’t forget about our brand new series we have introduced! “Hosting at Home”! A way to let you in even more and provide tips for the different types of events (mostly super casual) we have in our own homes. Interior Design – This has been an absolutely incredible year for the Interiors “side” of our business. 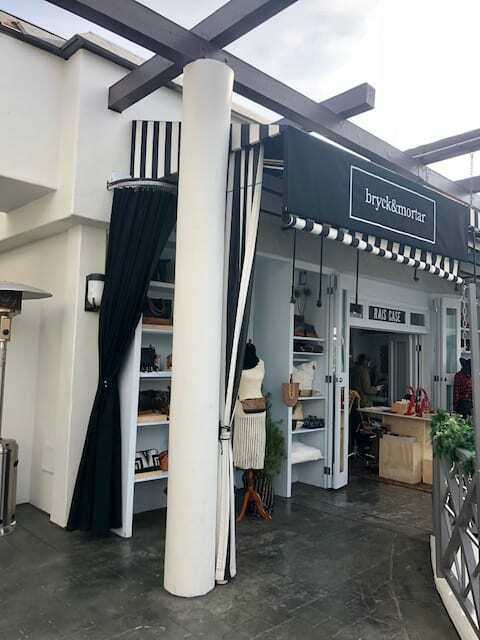 Lauren has been very lucky to have worked on lots of different types of projects including everything from design consultation to full construction and remodel as well as Interior Design both in residential and commercial spaces. We have loved every minute of seeing each vision come to life and are so grateful for having this platform to showcase our work. 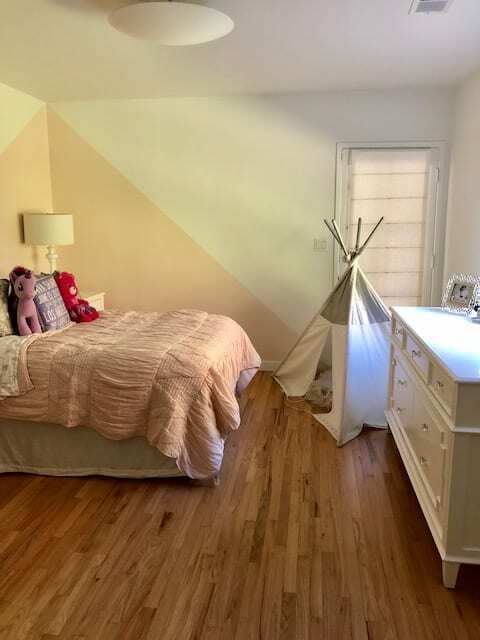 We have continued to include blog posts introducing our readers to the “Before and Afters” of completed projects, the entire process of her many construction projects, and various furniture and room designs. 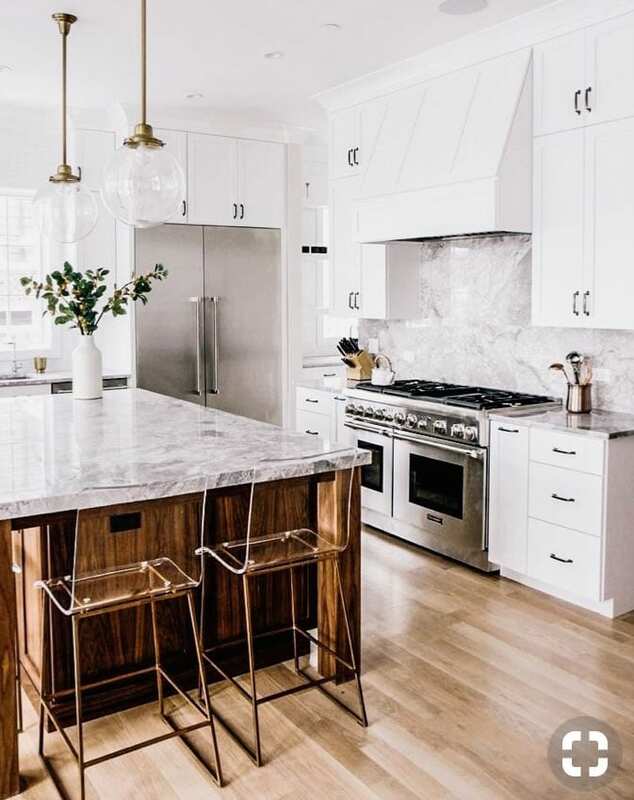 She has worked on many spaces this year that are true representations of her design aesthetic (gorgeous home remodels and designs, a stunning hair salon, and personal projects including the rooms of her own Modern Bohemian home, our dad’s remodel, and Tami’s baby nursery). The sheer amount of high end projects she has taken on this year is something to truly be proud of, and although we have not been able to showcase much from them yet on the blog, we cannot wait to do so! One such project, that you have seen from the very beginning stages, is what we call the “Modern with Antiques Home”. 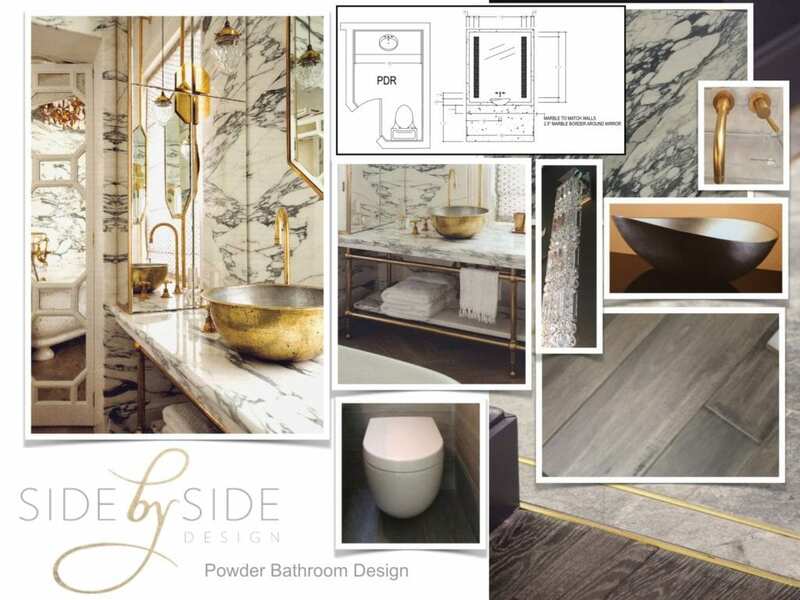 We have chosen to showcase the inspiration for the powder bathroom from this home tour today (as seen in our previous post, Modern With Antiques Powder Bathroom Update) to share how gorgeous these spaces will be when they are completed. We cannot wait to see it all come together and take professional photos! In the coming months and year, we plan to show the many other completed projects she has been working on and continue to take on interior challenges and new opportunities as they present themselves to us … Stay tuned! 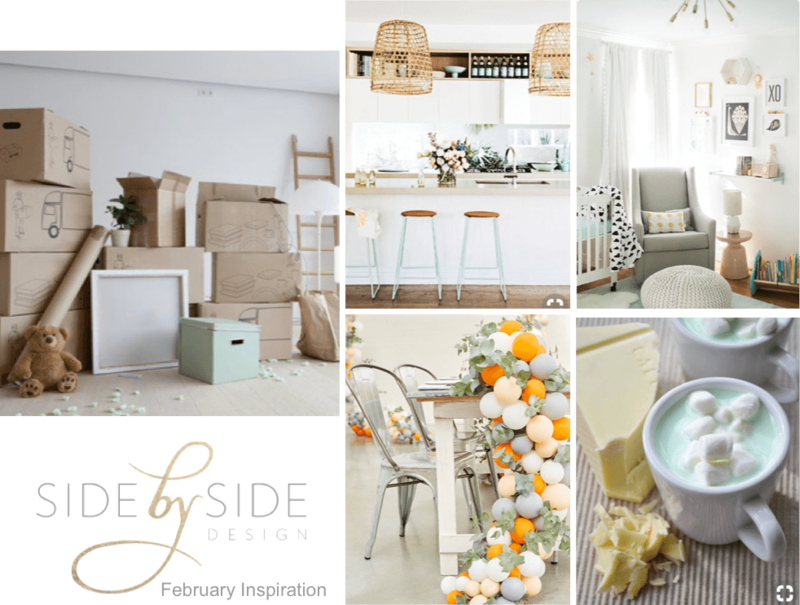 Event Planning – As we have mentioned, here at Side by Side Design we have two “sides” to our business, Interior Design and Event Planning. 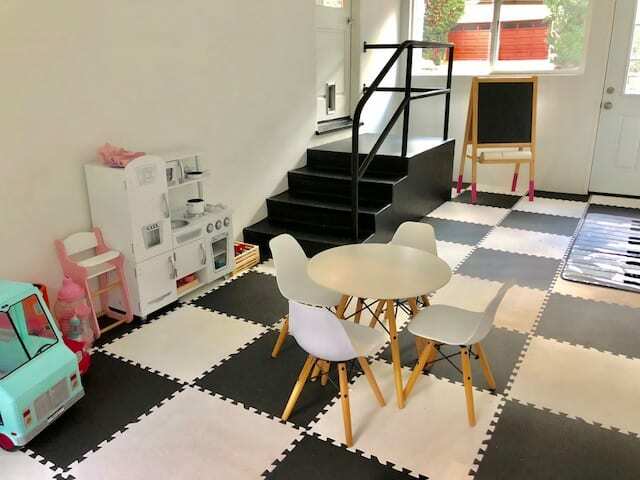 Our mission is to work with a family to design their home making it fit their lifestyle and personal taste. 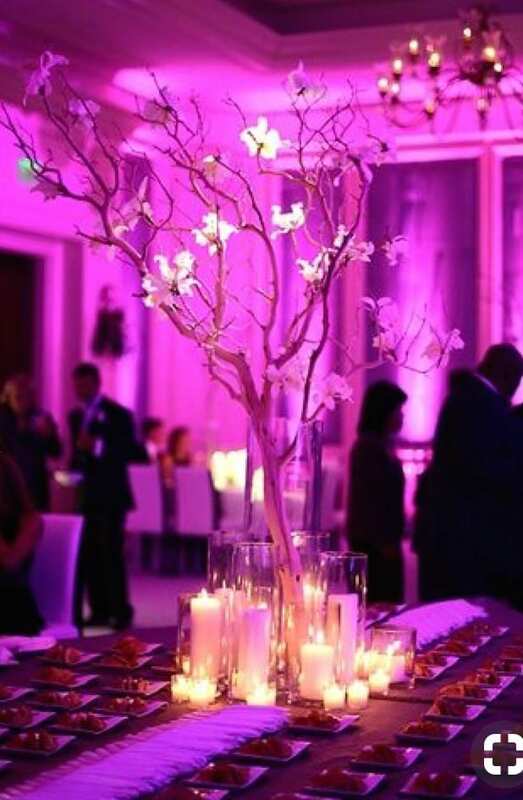 When assisting these clients with their home event planning, we not only get to continue to work with them Side by Side but get to pull from the look of their home for inspiration.Tami runs this side of the business and has taken on larger events such as weddings and Bar / Bat Mitzvahs as well. Each event we have planned has been amazing and we love exposing ourselves to various types of themes, clients, and design challenges. Every time we start a project it is different, new, and exciting! This year, with the arrival of Joie (Tami’s nine month old), she was not able to take on as much towards the beginning, but has found her stride and now has focused her attention on the events side of our business and the types of projects she wants to bring in (specifically fine tuning our model for at-home events and working with existing interior clients for special occasions and holidays). 2019 proves to be a busy year as we already have events in the books! The event we would like to showcase that we worked on this past year though is the 1940’s Themed Casino Night. It was a great night, an event in honor of a great cause, and just look at those stunning flower arrangements courtesy of House of Magnolias! Holidays – Wow! Every year at this time, we set a goal of growing in this area and bringing holiday cheer into our clients homes. 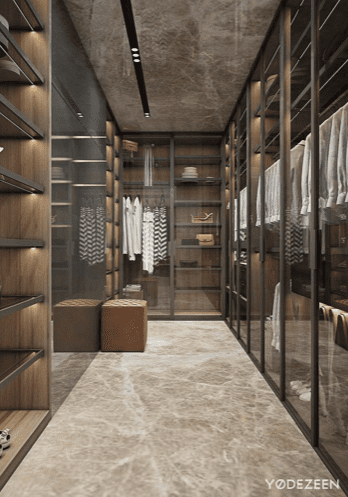 It has been a dream of ours that we have worked to communicate properly in order for our existing and potential clients to understand that we are not just a traditional Interior Design firm. 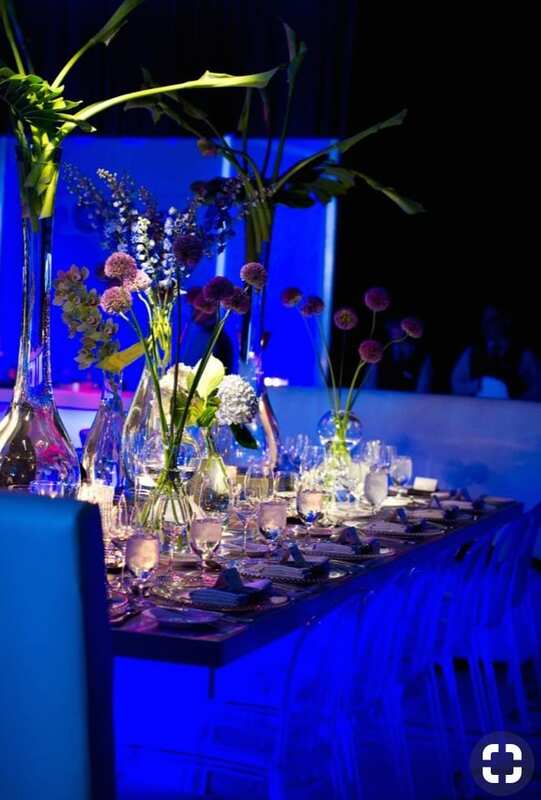 That our mission is to design beautiful spaces and dress them up for events and holidays too. This year, with the help of our social media, beautifully designed promotional materials, and blog posts to promote our holiday services, we booked our first Christmas and New Years clients. 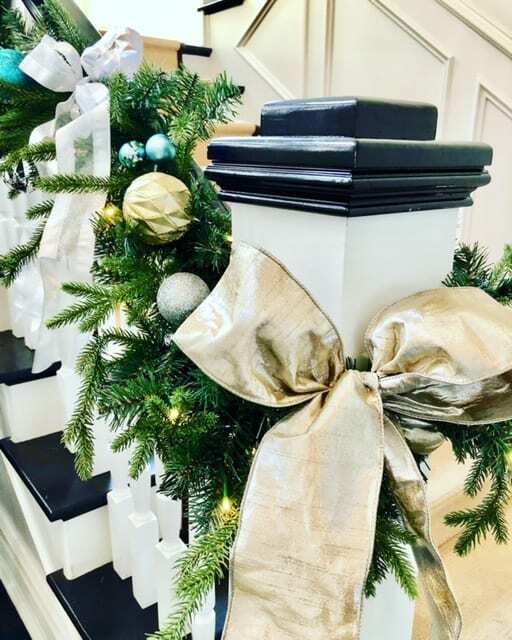 We are very proud of the knowledge we have gained in this area and the design we created in our client’s home (as seen in our previous post, A Christmas Village) and know that there is always room for growth. Stay tuned for our upcoming blog post with all the details from the fun filled theme party for New Years we are currently planning. 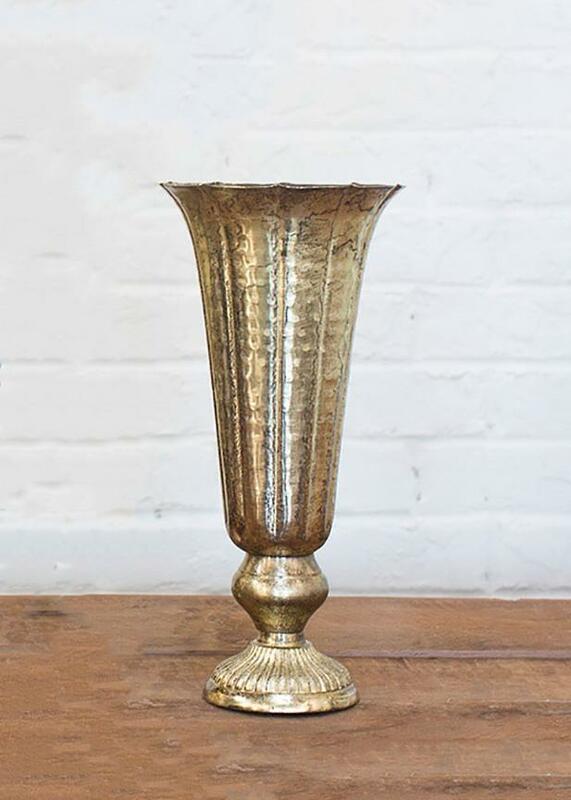 This coming year we have even bigger dreams of growing in this area, and hope to create memorable experiences for our clients at all holiday times (including table centerpieces, home decor, festive food and treats, gift wrap and planning everything from intimate family dinner parties to extravagant themed soirees). Custom Made Decor – Although we have lots of amazing vendors we work Side by Side with, we have been known to create many things ourselves. Everything from flower arrangements, to gift wrap, to handmade invitations have been showcased here on our blog. We enjoy putting a personal touch on each project and love doing so through creating handmade details. 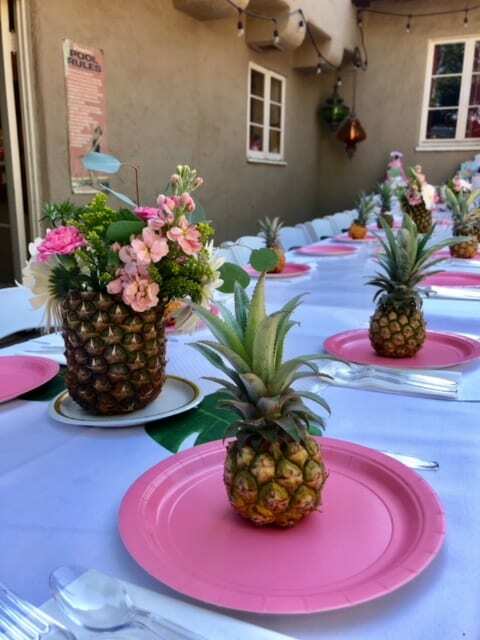 Our favorite of the past year was one particular project Lauren worked on in Tami’s honor for her baby shower (as seen on our post, “Let’s Flamingle” Baby Shower). There’s definitely something so rewarding about putting personal touches on an event for a loved one (although extremely hard to keep all your plans a secret from the person you usually tell everything to). 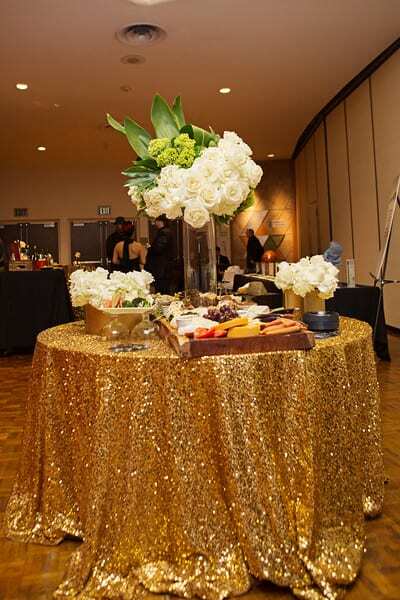 Tami and her guests loved arriving and getting to see each carefully placed detail. We love to create for our client’s events as well! This year, we plan to continue to leave our own creative stamp on each event (personal or not) while keeping who the party is for in the forefront of our minds. Guest Bloggers / Collaborations – This year, more than ever, we have taken the time to gain new perspective from other professionals (whether it be by listening to podcasts, taking e-courses, or meeting up with other moms who are business owners to collaborate with each other). All of this adds so much to our personal growth and the growth of our business as well as the way we picture it in the future. We are wide open to finding like-minded people who want to write guest blog posts and / or want to collaborate on special projects and hope to do more of that in the coming year! Shout out to those who have opened their hearts and minds this year to working collaboratively with us; Erica Leigh Photography, University Synagogue, Cosmic Lake Entertainment, Tim Schou, and the Smashing the Glass blog. 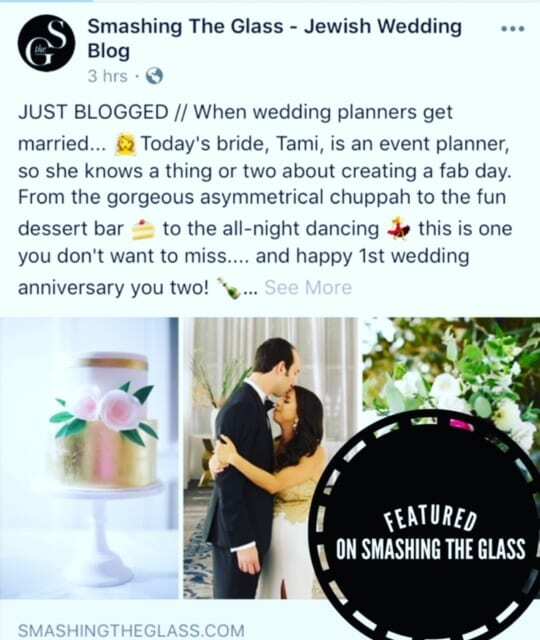 We especially loved getting the opportunity for Tami’s wedding to be featured on this site (as seen on our previous post, Smashing the Glass Featured Wedding) as well as her own insight into planning this special day as an event planner and bride! Our goal this year is to reach out to more creative individuals, small business owners, and larger well-known companies within our industry, to share their points of view on our blog as well as to collaborate, collaborate, COLLABORATE! Let us know if you would like to be our next guest blogger or would like to join forces with Side by Side Design to create something special. We would love to work with you! Pining For Pinterest – Our “Pining for Pinterest” posts allow us an opportunity to dream a little while still staying true to our business model. 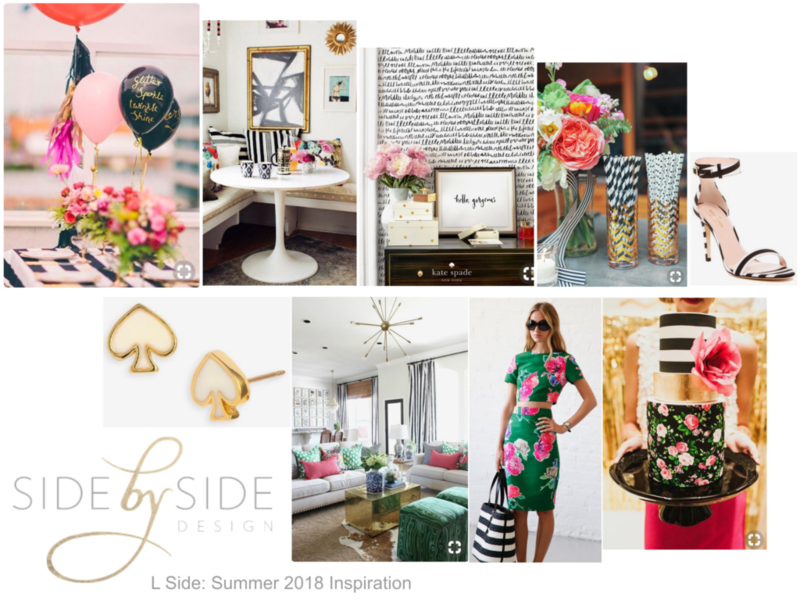 Four times a year, we share what is “pinspiring” each of us going into the upcoming season (as seen on our post Pining for Pinterest Summer 2018). 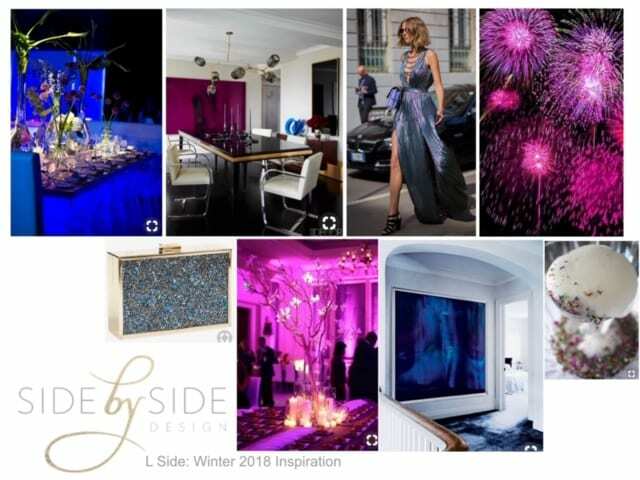 Each look highlights our exact business model in showcasing an event that works with an interior space as well as all of the details you would find there (signature cocktails, home accessories, delicious catered appetizers, and so much more). This particular post was our favorite this year because the two inspiration boards were so different from each other yet both so much fun! One a take on an East Coast tradition but bringing it to our hometown (LA) and the other an ode to an amazing designer (Kate Spade). By creating these boards, we are hoping to inspire those of you who are hosting parties in your near future or those looking to do something new with their home. Don’t worry, we are just a quick email away if we can help in any way. Email us at info@sbsdesignla.com. 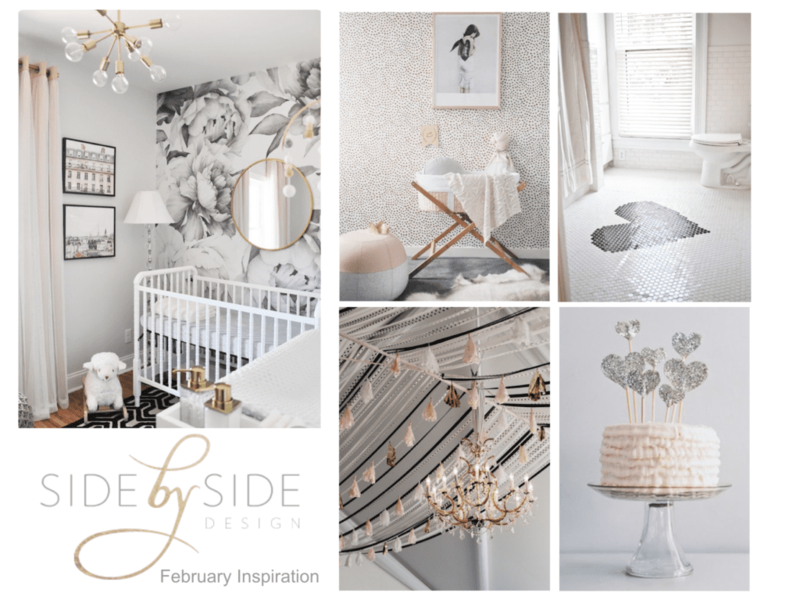 Get Inspired – This series features each of our inspiration photos for the month ahead along with two interior photos that follow the same look and two coordinating event photos. It gives us a chance to post what’s inspiring us each month and give a preview of what’s to come as well as really let our readers into our lives. In looking back, a personal favorite is our February inspiration (seen on our post Get Inspired: February) as this was a significant month for both of us in our personal lives … Tami was inspired to put the finishing touches on her daughter’s nursery before her upcoming due date and Lauren’s family was about to move into a new home of their own. Our readers enjoy our monthly “Get Inspired” posts so much that we also have continued writing and sourcing for our second part monthly “Get Inspired” posts. This has allowed us an opportunity to fill readers in on where to get some of the fun home and event items they see on our blog. We absolutely love writing this series and look forward to looking back each month on all that has been accomplished. Check back on January 4th for all new looks and inspiration for the New Year. When we began Side by Side Design seven years ago, the blog was the main focus (as we both had other full time jobs, and we were looking for a way to share our creative side with others). We have since shifted our focus. Our blog is not a main source of business. It is merely a way to document the projects we are working so hard on. We feel it is important to say this as we always strive to be transparent with our readers and want you to see that although we love our blog (We wouldn’t continue writing for so long if not. 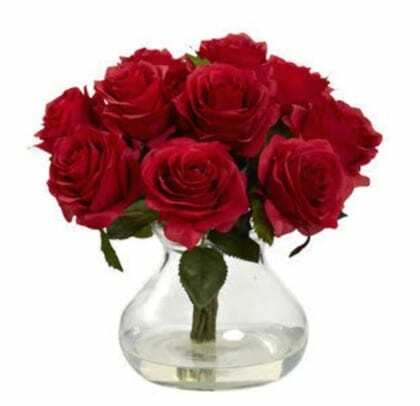 ), for us, we are able to love it even more this way. We so appreciate our loyal readers and plan to give all of you really exciting interior design and event planning related blog posts each Wednesday and Friday in 2019. If you have been following our story for a while, we would love for you to give us some feedback … What keeps you coming back? Any constructive criticism is welcome as well! As we mentioned, we are happy to have content for our blog, but even happier to have a business that is busier than ever! In order to continue to grow in the next year, we have really worked hard to come up with a short list of very tangible goals for our business that we will be working to achieve this year. Turn our trial “Designer Day!” series on Instastories into a regular part of our routine. Our goal is to post at least one of these “stories” each week to share a day in the life of a Side by Side designer. Send out two email blasts (Spring and Winter) that offer services with the true essence of bringing the two sides of our business together in mind (i.e. 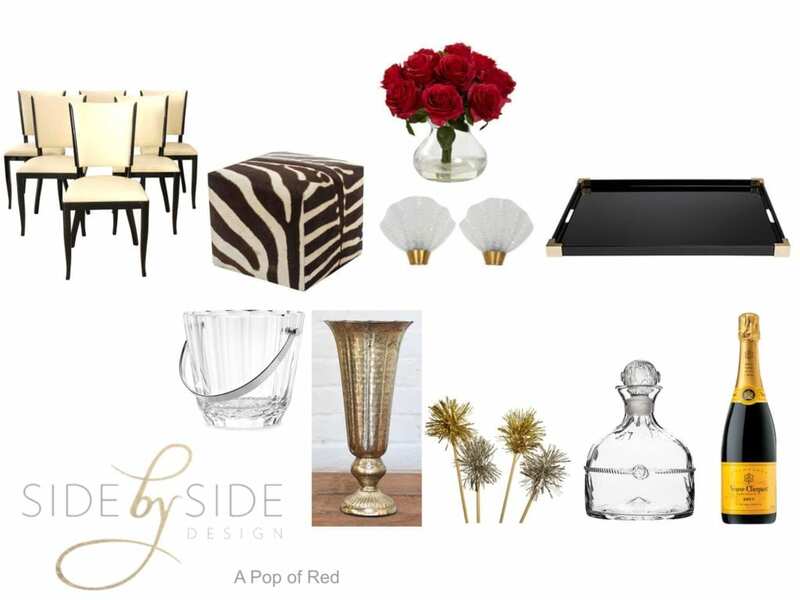 creating a look for the decor in your home at holiday times that coordinates with your existing design). Update the portfolio on our website to showcase our most recent and most beautiful projects. Write a new mission statement that communicates exactly what our business is all about in order to properly continue branding Side by Side Design. Continue to take on projects that fit our business model and strive to think outside the box bringing new exciting details to every project we take on. Alright guys, that was a lot of information! Time for a much needed break … We will be back on Friday with our “Favorite Five” from December and then will see you all in the new year. 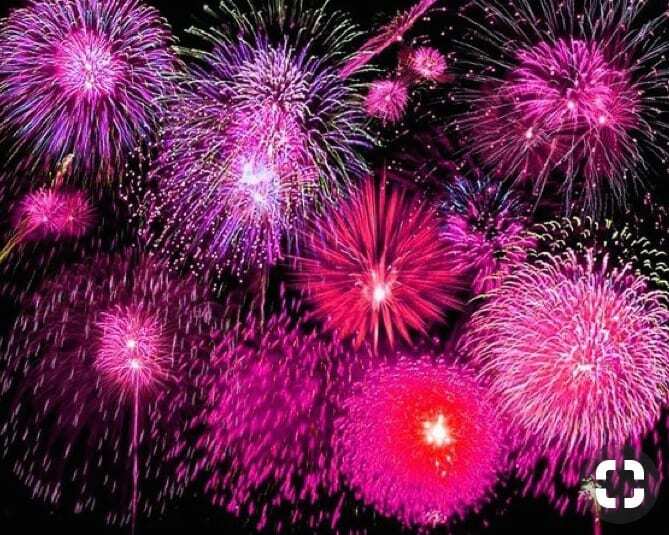 Have a happy new year from Side by Side Design! It’s almost a new year, and with 2019 just around the corner, it is the perfect time to switch things up a bit! 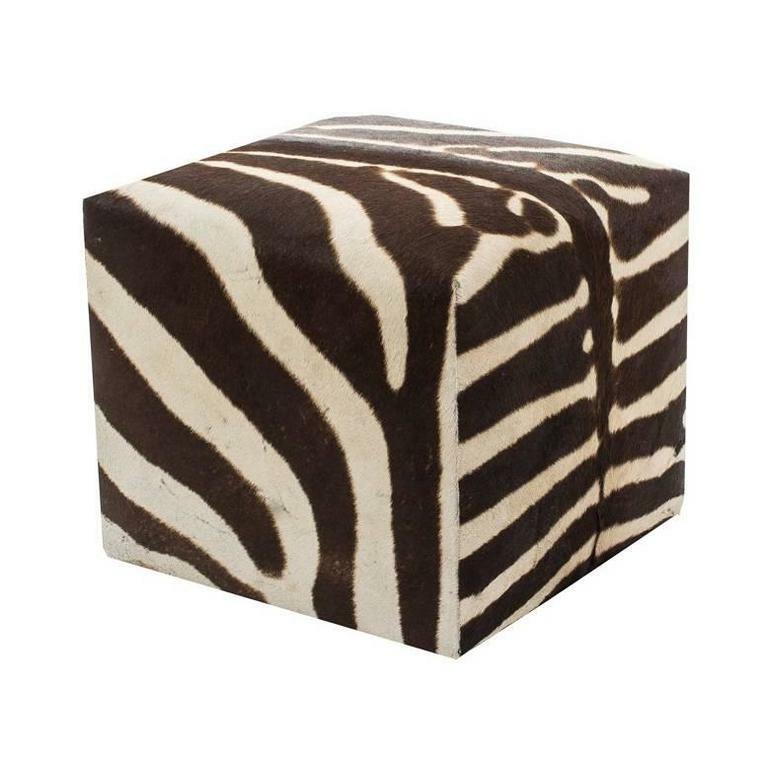 I would recommend adding in some sparkle, shine, animal print, and definitely a pop of red into your home and the decor for your events this holiday season. 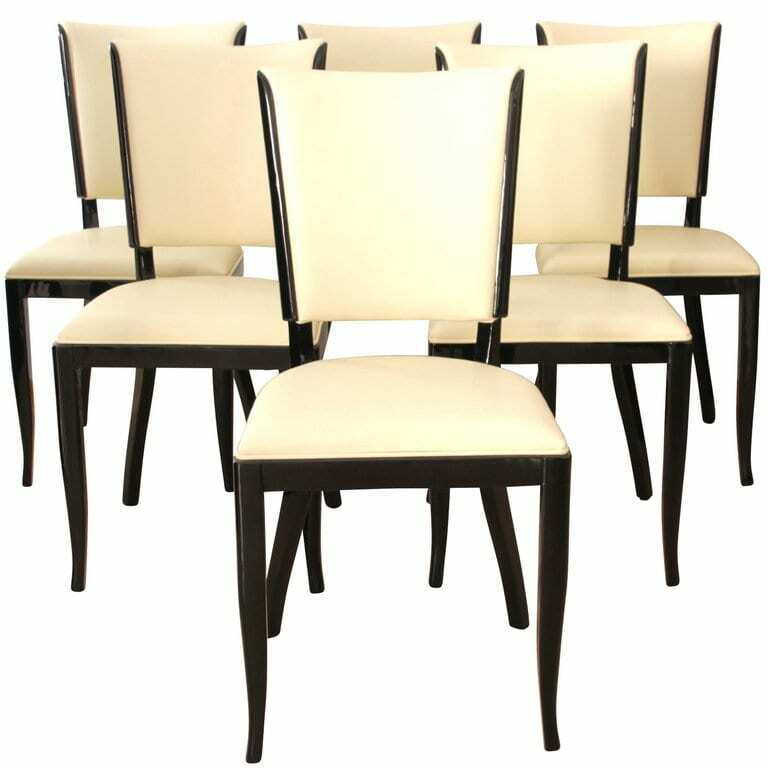 I have included a list of 5 must have items for your home and 5 event items that your guests will love. Don’t worry … I included a link to make getting each item that much easier. Enjoy! 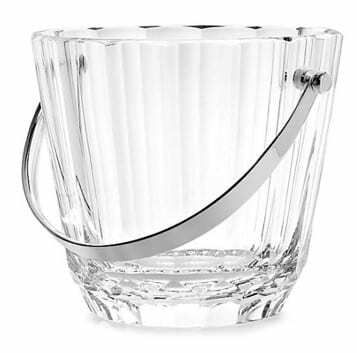 Ready to ring in the New Year with some flair? Try out one of these items … Why not all ten? Have a great weekend from Side by Side Design! Last year at this time I was busy creating rooms for my client’s daughter and son (as seen in our previous post, Casual Cozy Kid’s Rooms). Their parents gifted them different items for their rooms for the holidays and they were surprised by the fun details that were wrapped up under the tree. 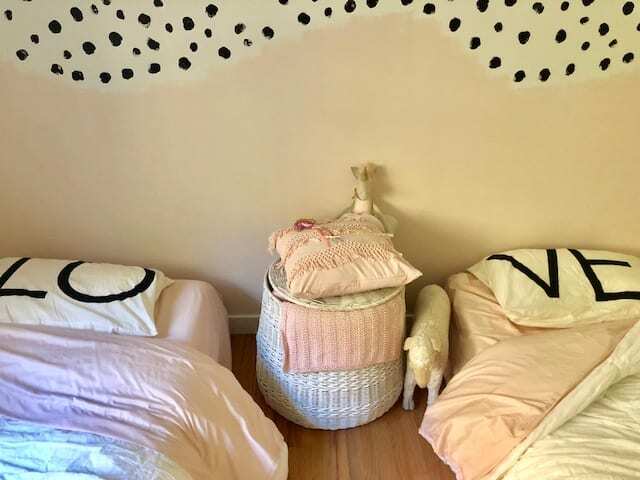 I loved the idea so much that I decided to do my own version of this in my house this year and used the holidays as my opportunity to give my twins a “bigger girl room” and to finally complete my older daughter Ava’s room as well. Ava’s room was almost done but needed some finishing touches to tie the whole look together. This space came together pretty quickly when we first moved in. 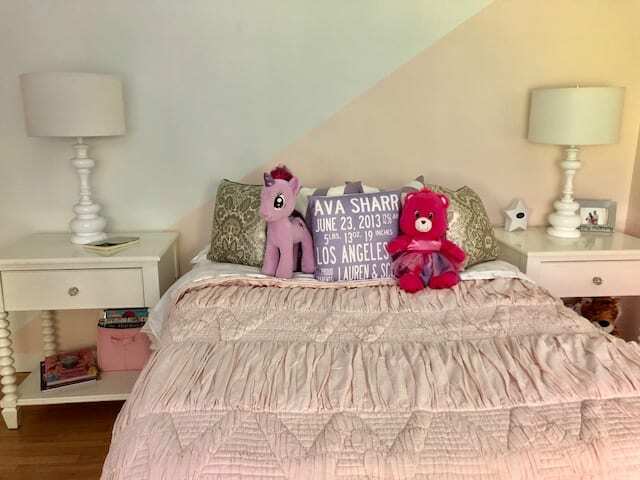 We gave Ava our old nightstands (that my dad built) and lamps as they fit perfectly and were exactly the right look for her room. We bought her a new bed to fill up the space better and because we all like to use that room at night to read books before bed. We bought Ava this awesome new quilt from Pottery Barn Teen which was the perfect finishing touch. I love the soft shade of blush and the cool boho texture it brings to this space. 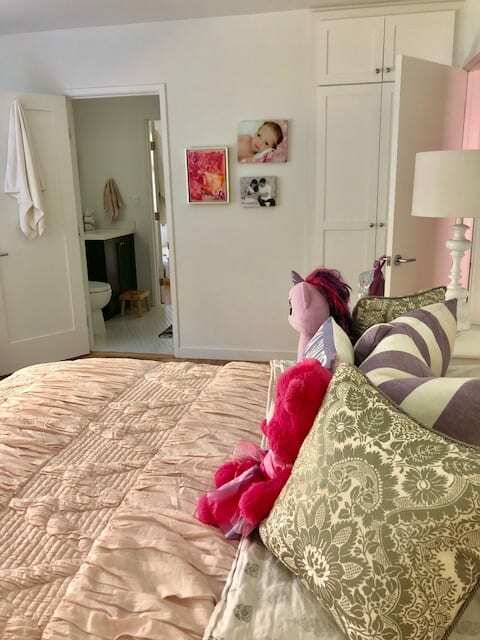 She already had all the additional pillows and these fun patterned sheets which bring a playful element. Fun fact: These silver and white pillows used to be on my bed, and the striped ones I made from fabric left over from Ava’s second birthday party. 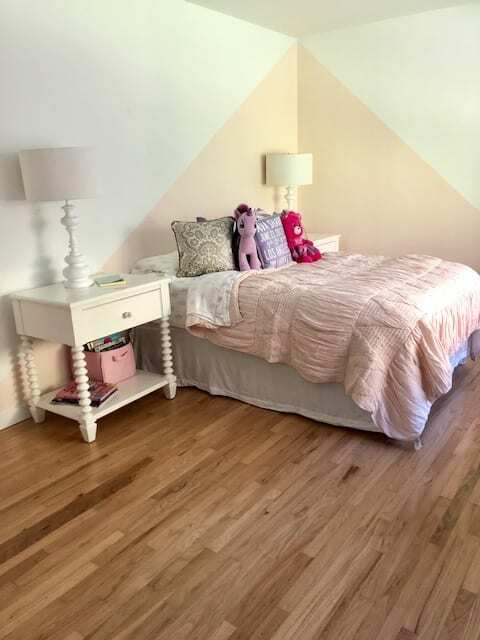 One of the first details I added to this room was this cool diagonal painting (Created of course by Angel!). Ava has since nicknamed it “the pink pyramid” and I still love it as much as I did day one. 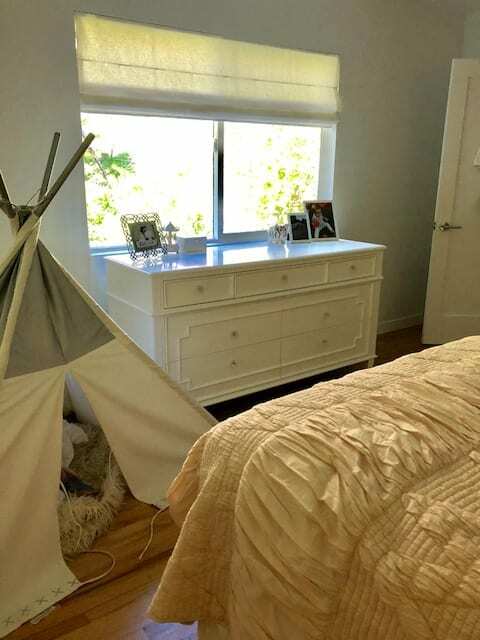 Ava was gifted this awesome teepee a few years ago from her “Grammy and Jojo” (as seen in our previous post, Transition to Toddler Room). She and her sisters love to play and hide inside. I added a furry pouf and some other fun pillows as well which just makes them want to stay in even longer. This dresser has been with Ava since she was born. Her “Saba” made it for her, and it will continue to be a great piece for her to keep clothes and other things in as she grows. During the construction, we removed Ava’s large closet to give us space for a bathtub on the other side of the wall. 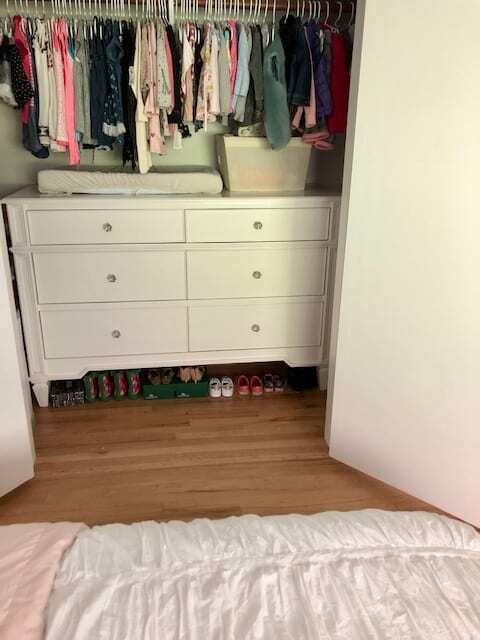 My dad built Ava a custom closet and while much smaller in scale than the original, every space is completely usable and it is pretty good looking as well. I added three canvases to this wall. Two from Ava’s first photo shoot and the last an original painting by Ava herself. 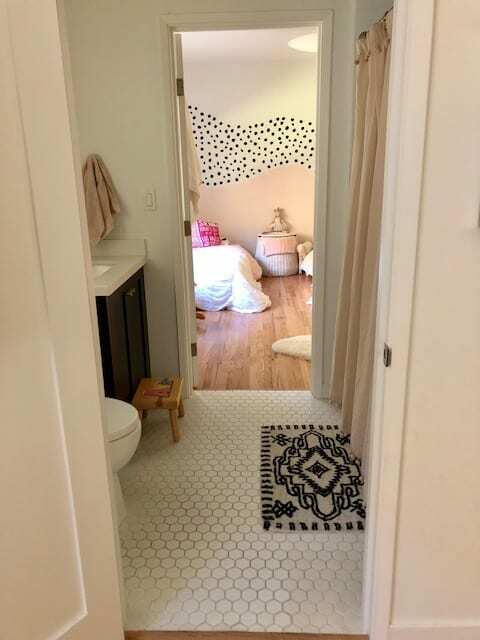 Here’s a view of Cara and Sienna’s room through the Jack and Jill bathroom the girls share (as seen in our previous post, Modern Bohemian Girl’s Bathroom). I love how each of the three spaces has its own details but look good all together. 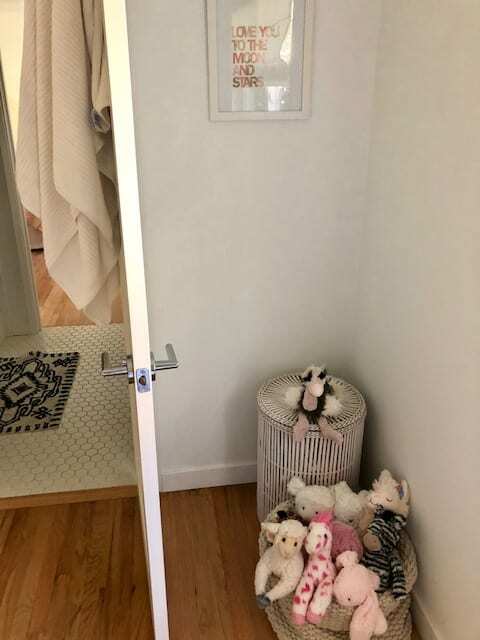 I corralled some of Cara and Sienna’s baskets in this corner and hung a special piece Tami gifted them from their baby shower above. The girls got new beds for Chanukkah (mostly because they were climbing out of their cribs anyway), but I decided to keep the mattresses on the floor for now until they get used to their new set up. 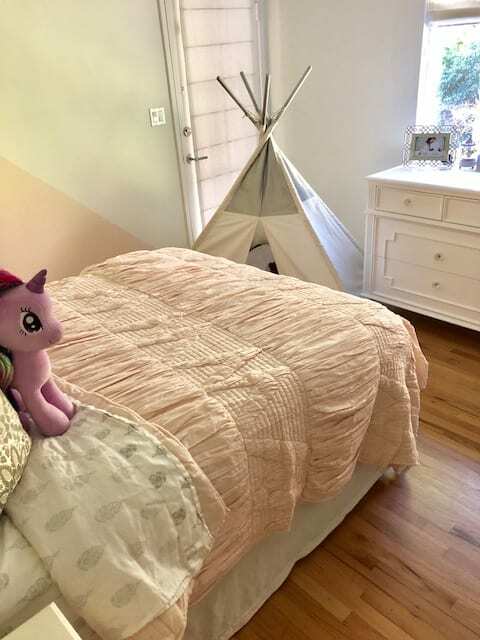 I had fun picking out all of the bedding we gifted them as well (from Pottery Barn) and decided to go with a mix of boho, feminine, and sweet. Angel and I had fun coming up with this wall concept as well. It adds just a bit of edge to this space. 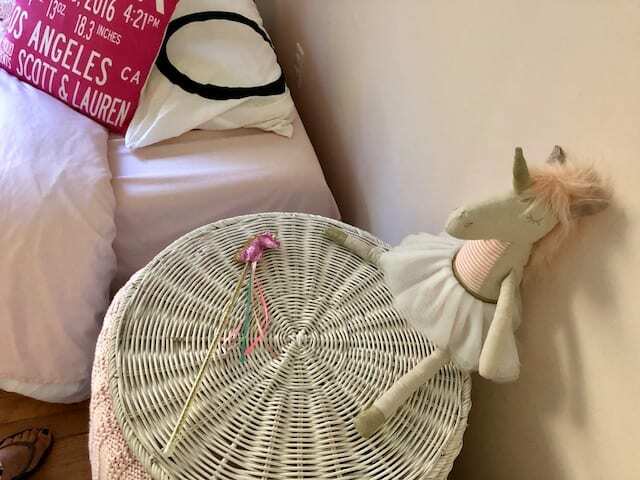 I decided to use this basket between their beds for now as it was the perfect height and a great place to store extra stuffed animals and blankets. I repurposed the girls baskets which used to hold diapers and such (Fingers crossed they get potty trained soon!) to create a book corner on the other side of the room. The girls love picking out a story or two to read each night. Angel created this awesome piece of art for the girls when we first moved in. I used it as the inspiration for the whole room. We moved the dresser my dad built into the closet, and I can’t believe how perfectly it fits in there (at least for now while their clothes are still so small). I took some time and really organized this closet. I love it when everything fits just right! I L-O-V-E these pillow cases I got for my sweet girls! I can’t believe they are almost three. 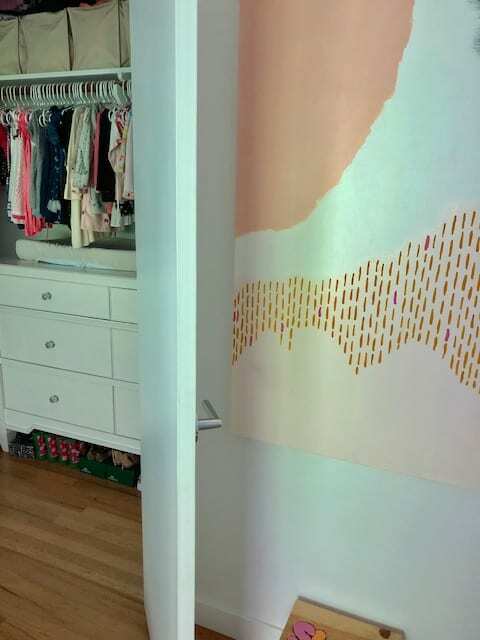 They absolutely love their new “bigger girl room”, and this mama does too! It makes me so happy to see the girls loving their finished rooms, and I love that spaces in my house are starting to feel more complete. 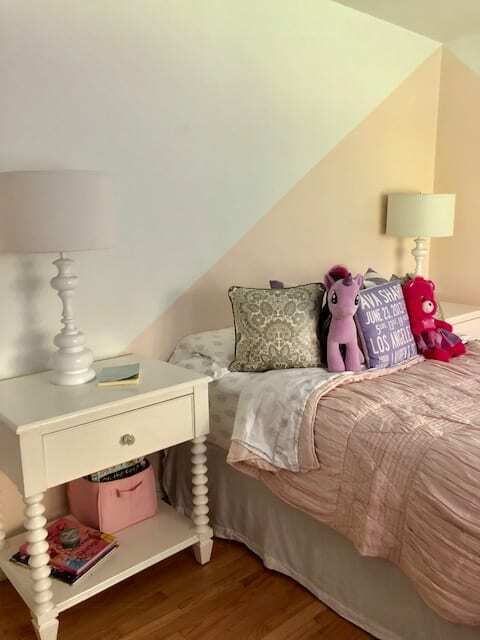 I had a full vision for how I wanted my girl’s rooms to look, and I am so excited for how it all turned out! I tried to source as much as I could in this post, but if there’s anything extra that you would like to know where it’s from, feel free to click on the speech bubble below to leave a comment. I would be happy to share with you, and as always if you have questions about our design services contact us at info@sbsdesignla.com. In our Pining For Pinterest posts, we prepare our readers for the upcoming season with interior shots alongside decor and event details in a fresh, new color story and overall look. Winter has already begun. The holidays are here … So many presents to wrap, pastries to bake, and parties to attend! 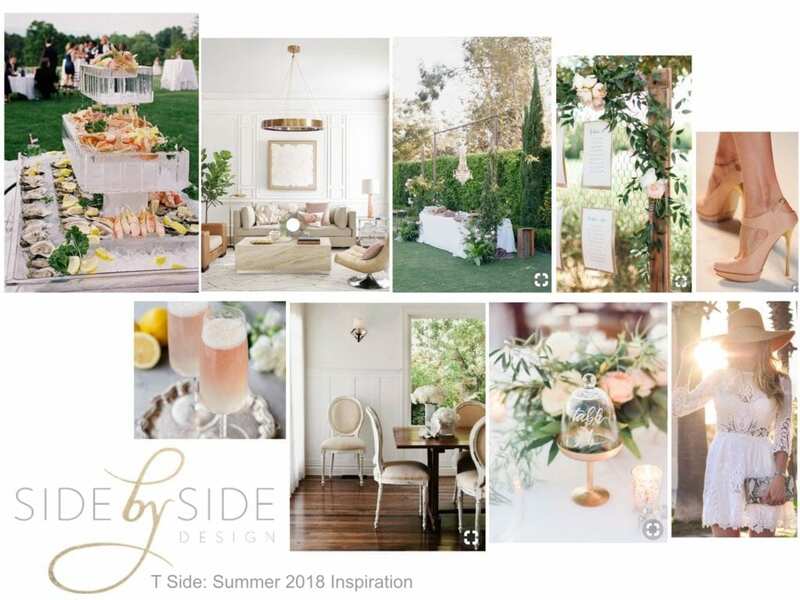 Please enjoy as we take you through our inspiration for two totally different concepts that stay true to the essence of the Side by Side Design model of Interior Design and Event Planning going hand in hand. These events, whether casual or over-the-top, are meant to take place where you feel most at home. Get it? Tami’s Pins: What’s “pin”spiring me this season? Wreaths, garland, and everything greenery! 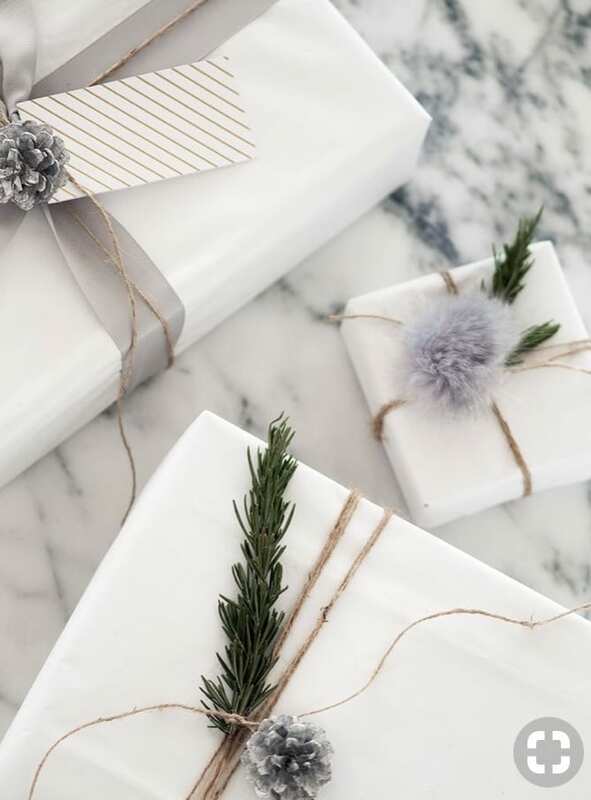 Crisp white backdrops are always in season, and you know I love me some touches of marble and shiny gold, but what really makes this year’s holiday decorations special are the more natural elements. 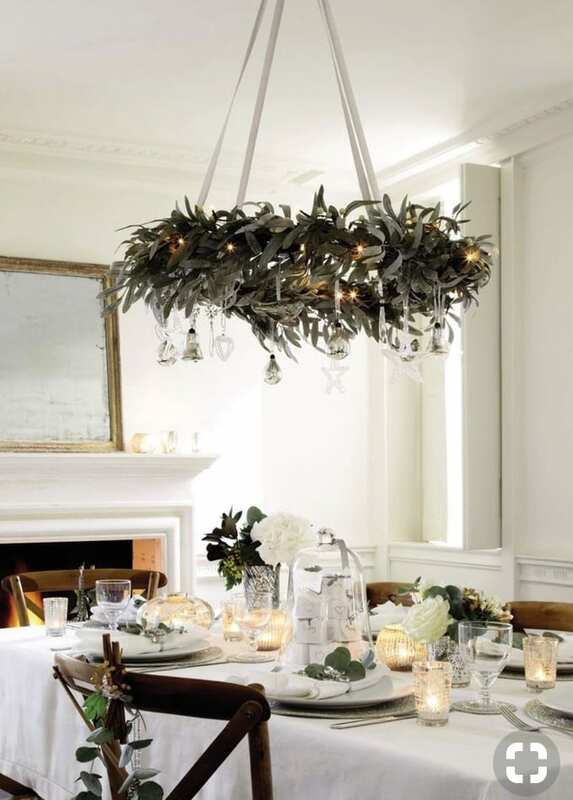 This family sprung for fresh (live) strands of garland in unexpected ways and fresh flowers too. A casual brunch with family is a great place to exchange gifts and sip hot cocoa. 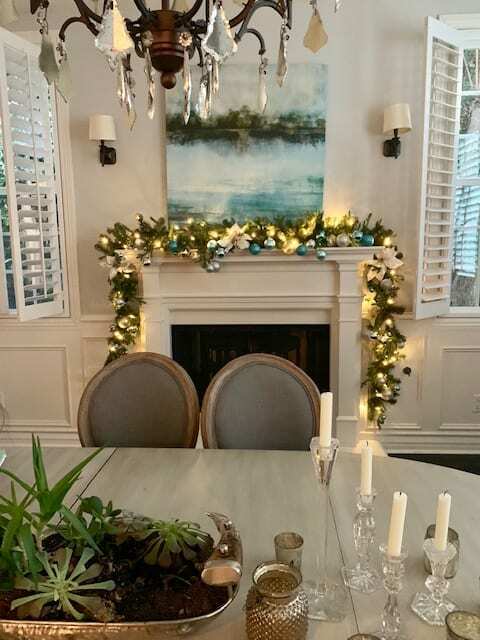 With this as your backdrop, you can really go any way you want with your holiday decor. Classic yet modern! Gorgeous accessories are appreciated all year long. 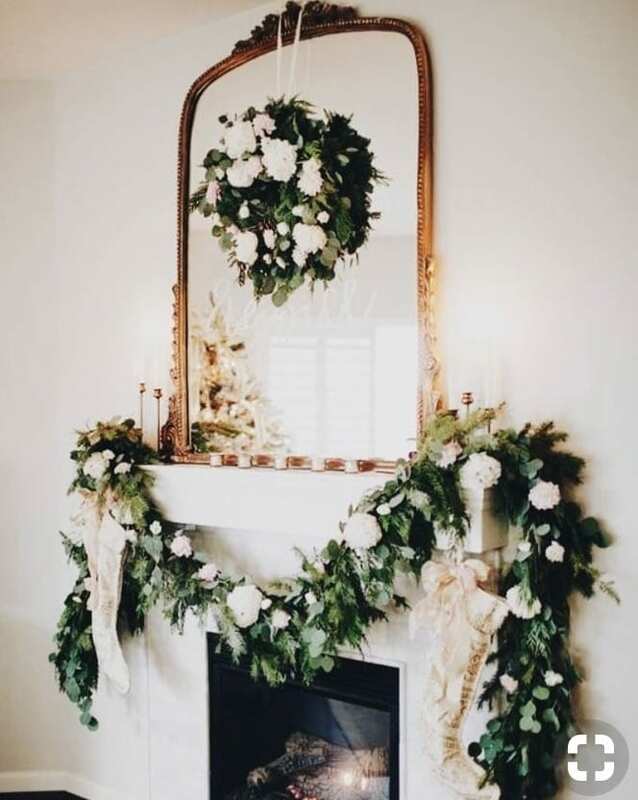 Fresh flowers make a statement in this stunning setting complete with candlelight, stockings, and a warm fire to sit by. This chandelier is beyond amazing! Guests will love looking up and around at all of the special party touches as they eat. 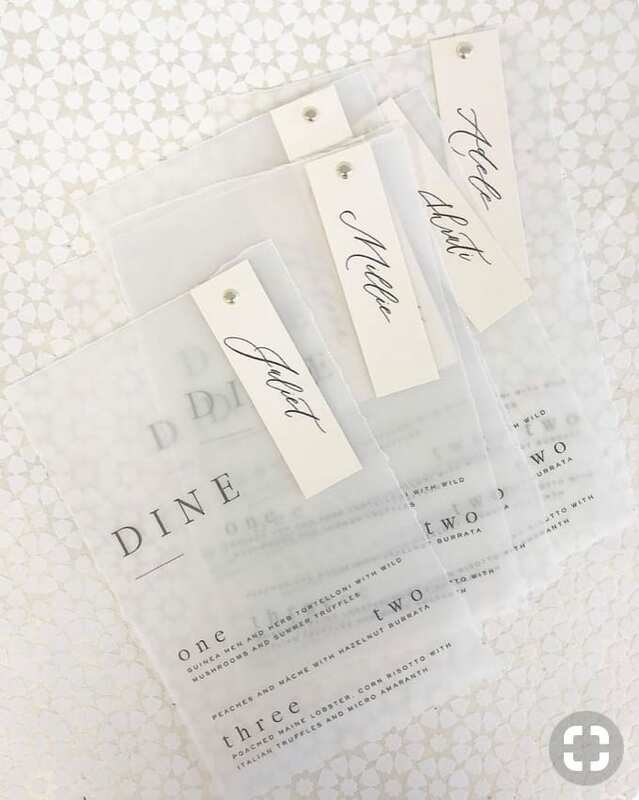 Menus printed on the chicest of paper prepare them for what is to come as well. 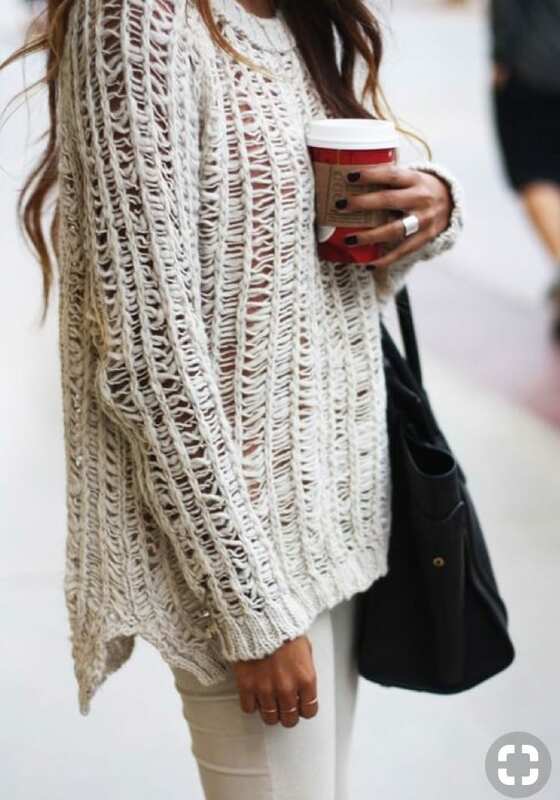 As this is a family at-home event, they are keeping it casual this year … Winter white! 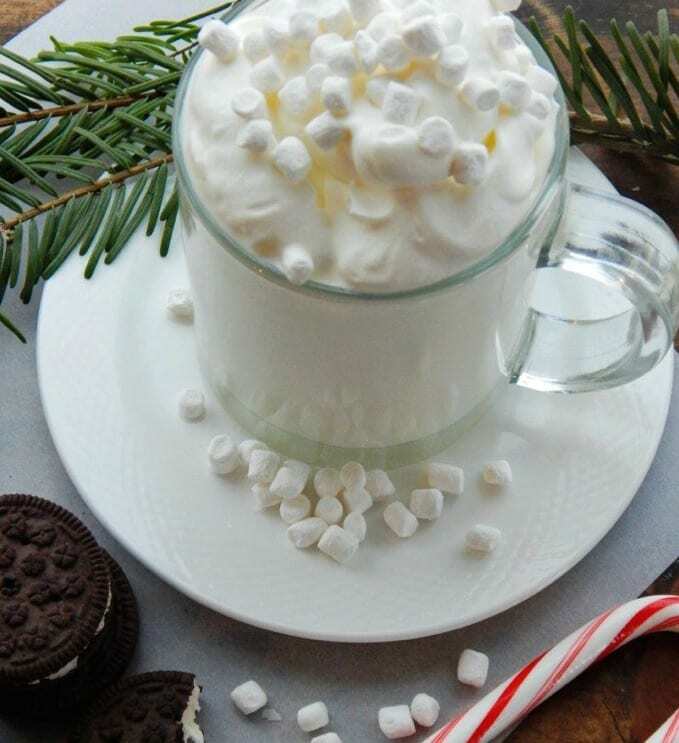 A cup of cocoa is a great way to toast this holiday season. This party host gets to make her own rules … She has personally picked out a special gift for each of her guests and wrapped them in style. Lauren’s Pins: What’s “pin”spiring me this season? Setting the tone with color through lighting! Hosting at home but creating a look that is so festive and unique you almost forget where you are. Greeted into the space with bold colors (like fuchsia and indigo) is a great way to create a large impact through something so simple, and all the other decor elements come secondary but are special in their own right. 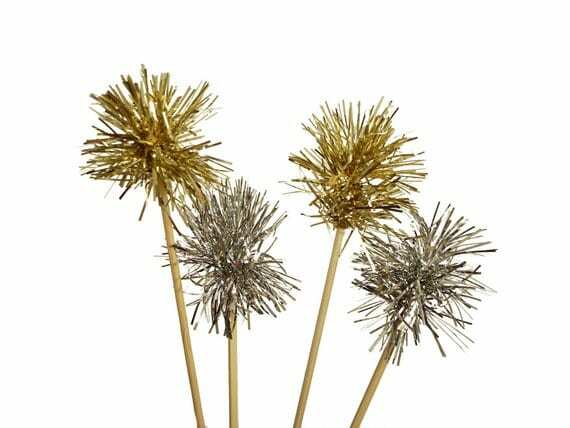 I am picturing a very upscale New Year’s party for all the major players in the Hollywood Hills. Dressed to perfection, wined and dined, and ending the night with a private fireworks show. This gorgeous home is bold all year long. 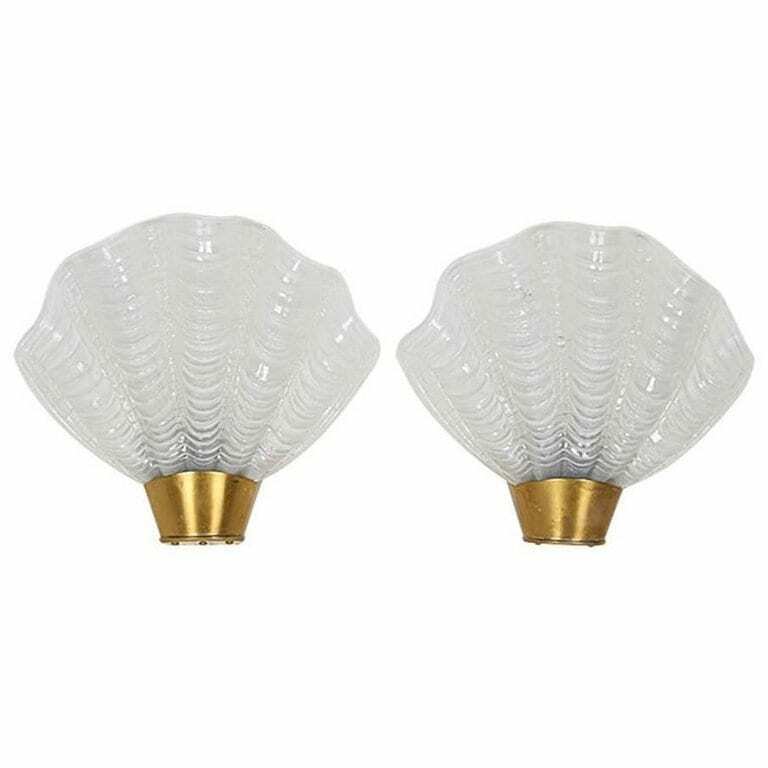 Enhanced through lighting, it will take on a whole new vibe. 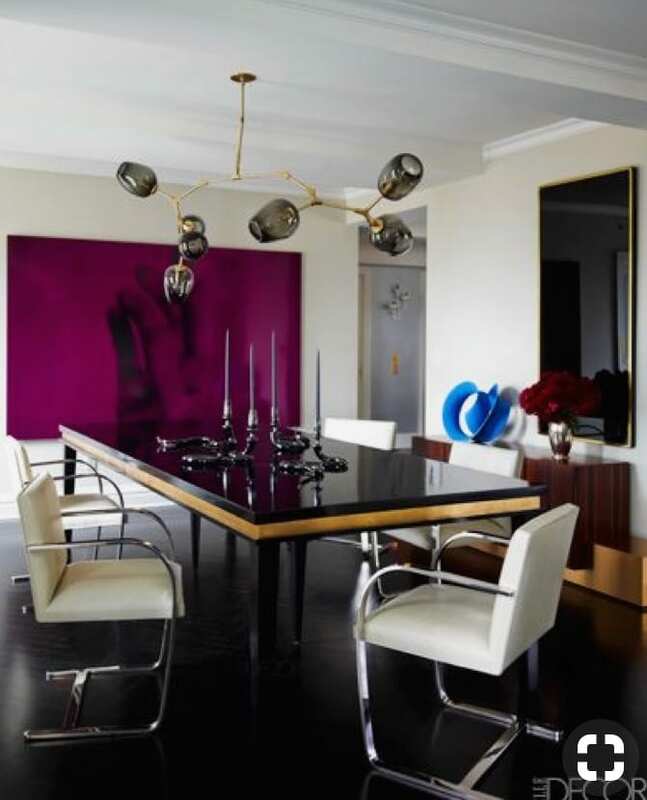 Another space in this amazing estate which gave us the color palette from which to work off of. 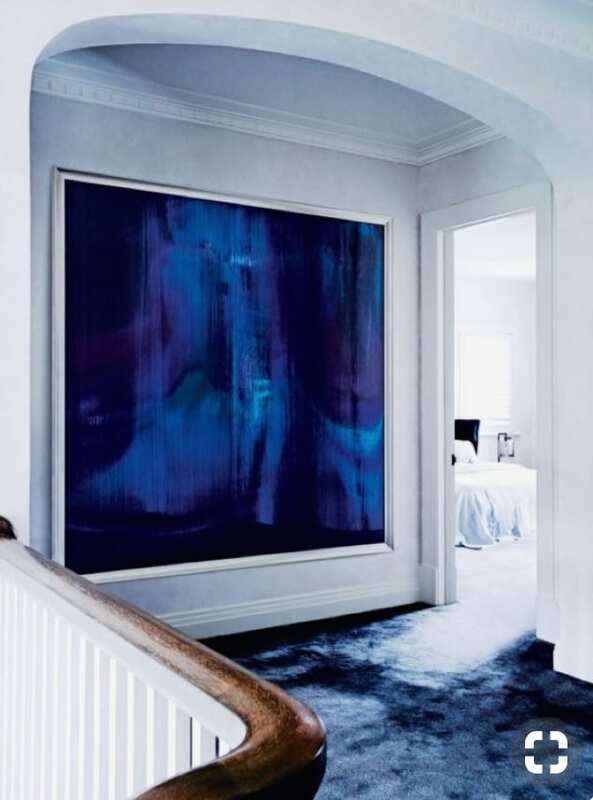 … and changing colors as you move from room to room is just to die for! The guests pull out all of the stops this New Years and dress in iridescent gowns that fit the theme. 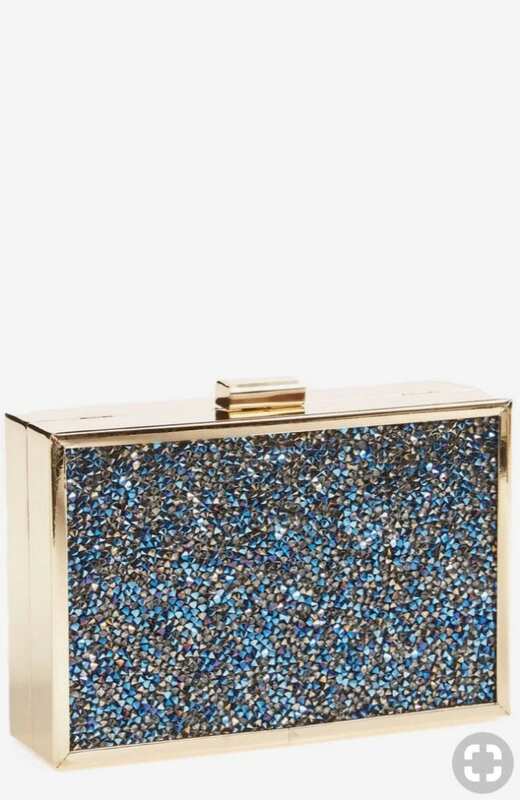 Glitter and sparkle is what this time of year is all about. 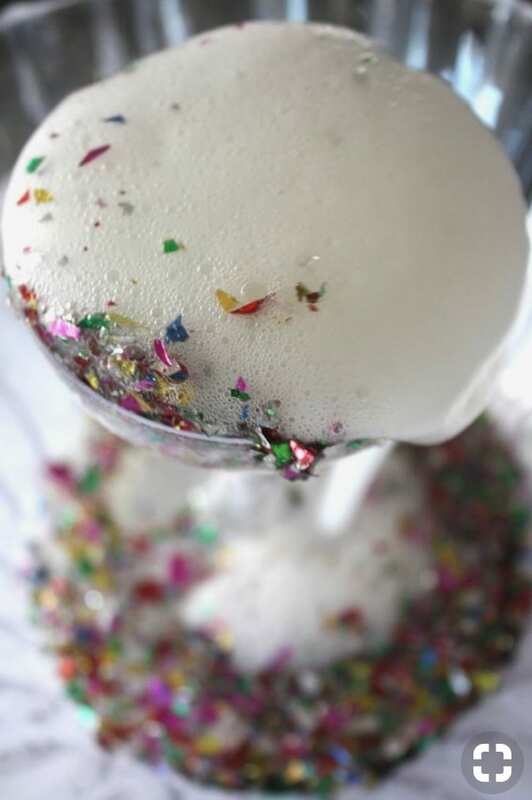 A festive cocktail that screams New Years! This Winter is our busiest yet, and we are so excited to continue bringing the events “Side” of our business to the next level. 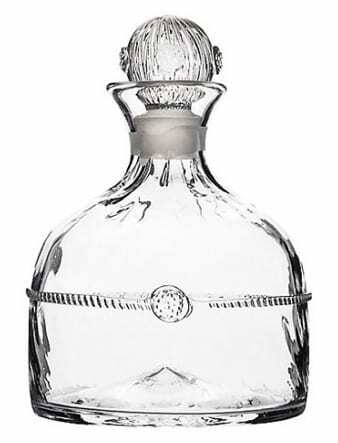 We look forward to all that is coming up this season and hopefully using some of this inspiration in our own planning. We would love to work with you in creating the right look this Winter by tying in the inspiration of your event with the essence of your home decor. Contact us at info@sbsdesignla.com for more information.